Thais and bananas are good old friends. A banana tree is, literally and figuratively, so fruitful that its dub name ‘The Giving Tree’ is nowhere near an overstatement. For instance, the long and strong banana midribs were play horses for many Thai grandparents. You might need a little imagination. Don’t forget to add ‘hee-haw’. The classic goodies themselves can be boiled, deep fried, glazed with salt or sugar, or baked with honey into a kind of can’t-stop-won’t-stop sweet treats. Yes, there’s more to Thai banana desserts than bananas in coconut milk! You’ll likely stumble across the divine smell coming from a stall on every other block. The brownish golden pieces are thick slices of ripe banana. They are dipped in mixed flour and sometimes sesame seeds which add a mellow aroma and crunchier texture. Most of the time you’ll also find deep fried taros and sweet potatoes. They taste just as good, if not better, depending on your taste! 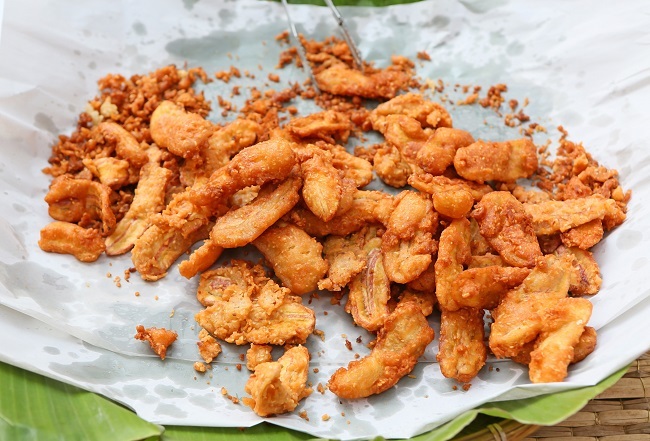 Thai banana desserts – deep fried and crunchy! 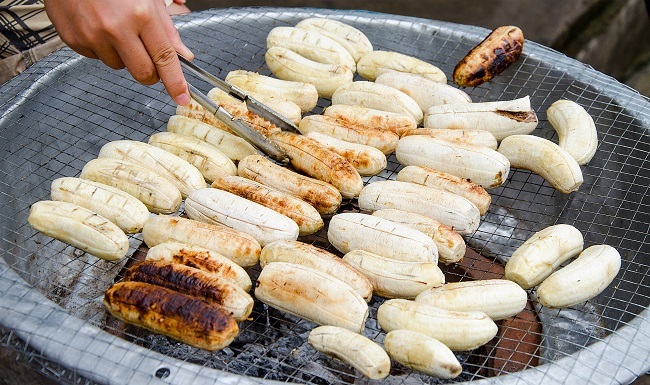 These cultivated bananas are grilled on a Thai charcoal stove which grants them an inexplicably delectable scent. Each banana ripeness varies; the riper, the sweeter and softer. These natural sweets make for a good idea if you have a sweet tooth but also blood sugar issues. We’ve seen grandmas munching on these guilt-free pleasures. But if you want to feast on some local sugary tidbits, get our rarer-to-come-by favorite sticks of smashed grilled bananas with caramelized sauce. We find it one of the local hidden culinary gems. But again, you’ll need a little luck to find the perfectly grilled and succulent ones. Thai banana desserts – charcoal-grilled and naturally sweet! The ubiquitous thin golden slices might look like an ordinary Joe, but the salty, caramelized, paprika or barbecue sprinkles make the crispy crumbly a local’s go-to. We also find it a must-bring on road trips, munched over magical scenery and inside jokes. Unlike other Thai banana desserts, this one is made from Gluay Leb Mue Narng (literally ‘female fingernail banana’). The name gives away a huge hint on the petite, curvy and overall feminine shape of the southern specialty fruit. These honey-glazed brown bananas are the local version of energy bar that will boost up your blood sugar on a drowsy afternoon. Be careful, though, you might finish a whole box in one go without realizing it! Because we save the best for last, it’s time we introduce you to two of our most beloved Thai banana desserts. They might not win the genetics lottery compared to their Thai dessert siblings, but as the cliche goes, looks aren’t everything. 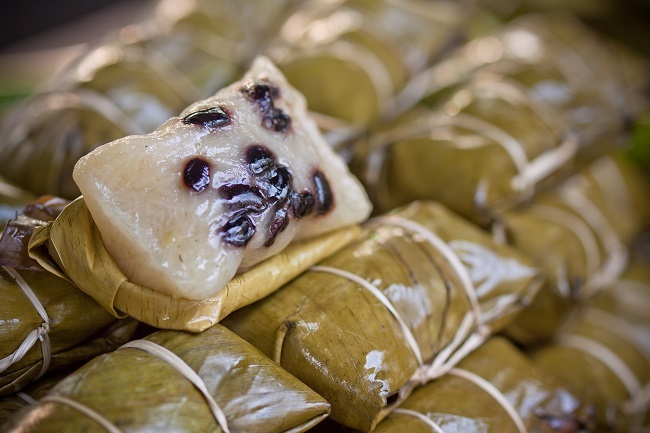 This sweet sticky rice with banana filling and black beans is another classic Thai dessert. The green banana leaf wrapping might make you hesitate, but don’t let your skepticism get in the way. In fact, it keeps the traditional authenticity intact. Our small tips would be to balance out the sugariness with a cup of tea or a cafe noir. Thai banana dessert – Thai banana with sticky rice is authentic, local and a hidden gem! And finally, meet the most ‘banana’ Thai banana dessert: Thai steamed banana cake. This grayish light purple cake topped with coconut might pale in comparison to its crunchier kin. But to us, it is among the most underrated Thai desserts. The perfect blend of mashed banana, salt, sugar, and coconut milk makes a dreamy afternoon energy booster. In fact, we wish we had some in our office now!